I read this fascinating book around my recent Cornwall holiday (alas, the lovely hardback was too substantial to take down on the train) and was racing to get back to it on my return. It’s a personal history, musing and philosophical discourse (but readable and engaging) by a fascinating and well-known founding parent of Virtual Reality, and in the way of these things, I then found myself editing a reference to it in the bibliography of an academic thesis and talking with an air of knowledge about, “Well, of course, even a wire-grid world can be immersive and wonderful if only you get the tracking right and minimise delay” when talking about a friend’s recent VR experience here in my home city! And, the author is prosopagnosiac, like me! There might have been a small whoop when I read that bit. Thank you to Bodley Head for sending me a copy to review for Shiny New Books, and you can read my full review here. Greta review, VR is one of those technologies that has always been in the consciousness and then one day just seemed to turn up for real. The history of it must be fascinating. 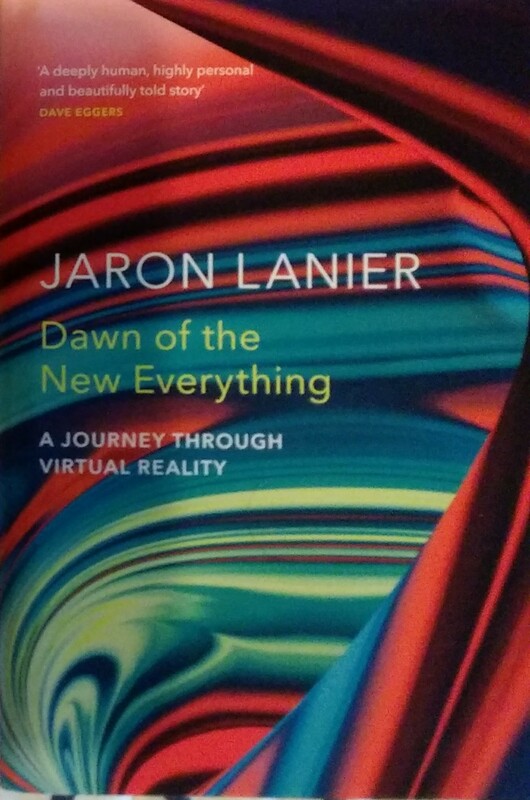 I love that the book is divisive because of its structure, probably as divisive as VR will be when people start to get addicted to it in the future. Yes, indeed. Glad you enjoyed the review.